Sometimes I find it really refreshing to bake fruity cupcakes as opposed to the classics vanilla and chocolate that everyone loves. I also wanted to try out some a new icing kit that my friend gave me. It was one that had squeezy bottles to put he icing in and an assortment of nozzles to pump the icing through. I love the nozzles but the bottles were awkward to fill and a nightmare to clean! They also discoloured making them look horrible. But that aside, they produced good results. And they went down a treat with my friends! Baking them also gave me chance to mess around with different styles (hence the sprinkles!) 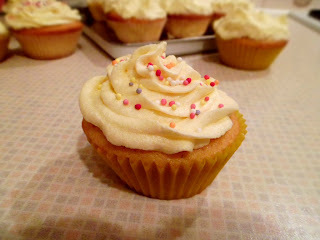 as usually I am baking for an event which means the cupcakes are under strict instructions to look perfect! 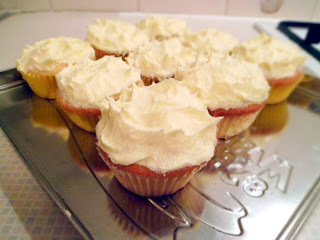 The recipe is from my very first cupcake book: Cupcakes by Susanna Tee. I really recommend it has some great recipes in and I always seem to get success! Preheat the oven to 190oC/375oF/ Gas Mark 5. Place 12 paper baking cases in a bun tray. Put the flour and baking powder into a large bowl. Add the margarine, sugar, eggs, lemon rind and milk. Mix together until smooth. For best results, use and electric hand mixer. Spoon the mixture into the baking cases until they just under half full. Bake for 15-20 minutes until they are well risen and golden brown. Transfer to a wire rack and leave to cool. Beat the butter in a bowl until light and fluffy. Add a third of the icing sugar and beat until smooth. Repeat for the rest of the icing sugar. Add the lemon juice and beat until smooth and creamy. Personally, I would ice them to look smooth and fluffy but the choice is yours as these are so versatile. Adding colourful sprinkles contrasts from the yellow icing making them ideal for children. Or adding lemon jelly sweets, like these ones, can give them a professional finish!